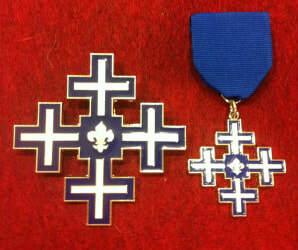 The Order of Our Lady, Help of Christians is an award of merit given by the Society of Mercy. The Order of Our Lady, Help of Christians is the highest award bestowed. Honorees may be chosen by the Superior General for having displayed exemplary support to the Soceity. The Order is awarded in two classes of Knight/Dame and Knight/Dame Commander, with Knights/Dames receiving a medal and Knight/Dame Commanders receiving a breast star. A certificate is also provided to recipients of the order.